TipsVideo: How to Cut Winter SquashCooking for a Crowd? 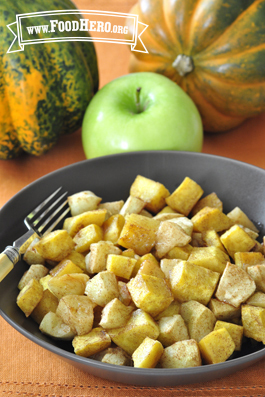 1 Comments for "Baked Apples and Squash"
I've been making this recipe for quite some time, and it's great. I usually don't add the salt, and we mix it in with steel cut oats, sometimes adding coconut and walnuts or pumpkin seeds for added protein. It can be a savory or sweet dish, depending on what you like. I've served it at dinner with braised kale or chard and a protein dish and it was also great. Kids and adults loved it!